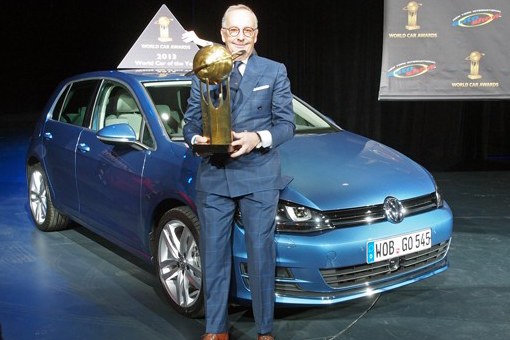 German car Volkswagen Golf MK7 out as the World Car of the Year 2013. Hatchback cars are getting the highest points from motoring journalists worldwide. Volkswagen Golf the seventh generation was successful defeat the strongest candidate as the Mercedes-Benz A-Class, Porsche Boxster, Scion FR-S (Toyota 86) and Subaru BRZ. Volkswagen Golf assessed not only in terms of performance, but also save fuel consumption. Volkswagen Golf scattered in several developed and developing countries. Inauguration is increasingly raising the name of VW after last year's VW was also fortunate to get a title World Car of the Year by VW UP. VW Golf MK7 is the first model VW the uses MQB architecture. For gasoline engines (1.4 liters) VW Golf MK7 has a fuel consumption of 20 km/liter. While for the diesel engine TDI powered 105 horses, has a fuel consumption of 62 miles/ gallon or 26.3 km / liter.